This is the second Thursday of the brand new year and the first throw back Thursday! So welcome! We love spending time at our lake house, aka Happy Hill and recently I snapped a few pictures of some of our favorite nautical decorations. We hope to spend a lot more time down here in the coming year. It will be our 6th year here and I foresee several changes coming! Over the last 33 years we’ve moved every couple of years. This made decorating each house fun and before we could tire of it, we moved! But the lake house is different since we plan on keeping this one forever! When we are here we host a lot of family holidays and get-togethers. It’s great because most of our families live close by and can come visit for the day and don’t have far to drive home. However, those that live a bit further can crash with us or my parent’s or brother’s house. Happy Hill has a beautiful lake front view. The sunsets are spectacular and since we are off of the main channel we have the perfect boat/people watching spot. It’s fun to see the Catawba Queen, the huge paddle boat that gives tours and dinner cruises glide by several times a day. If you happen to be out in the boat when they pass, the passengers always wave. It’s one of the things I love about North Carolina! We found some cute anchor pulls from Lowe’s as well. They hang from each of the fans in the house. ALso, they were pretty inexpensive. Only a few dollars each. We searched and searched for a large ship wheel to use as a decoration. All of the ones that we found were well over $100 and more than we wanted to pay. We found this one for $40. It looks perfect hanging in the basement man cave. This is the fish my husband caught in Key West several years ago. Actually, it is replica. The original fish was tagged and released. (Otherwise I’d feel guilty.) But this guy is a duplicate of the real one and he fits perfectly on this wall. My husband insisted on the spot light. Speaking of my husband, this metal sign hangs on the door of the master bedroom. After all, he is the Captain! I found the sign on eBay. 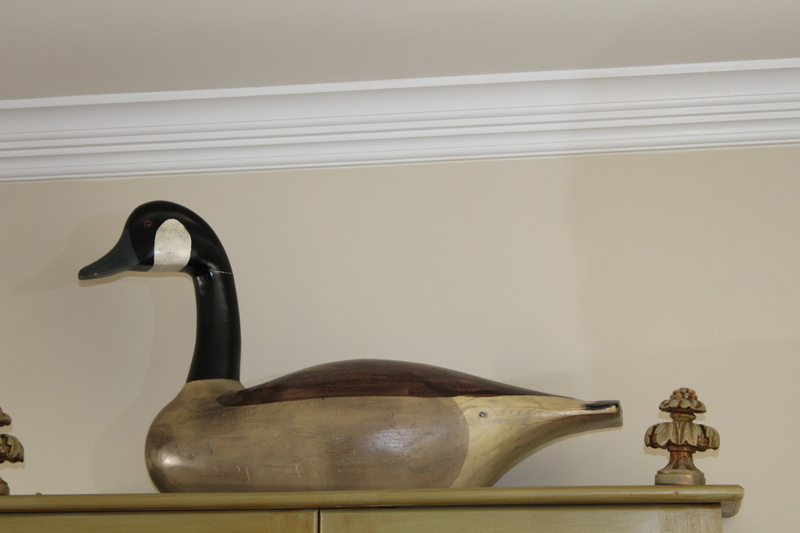 I found this large goose decoy at the antique store. He is beautiful. And when we are at the lake, Lacey can be found in one of many places. She likes to keep an eye on Happy Hill and her “big pool”. We can’t decide which is her favorite spot! Patriotic Decor for Memorial Day!